On February, 2 and 3 a «Horse program – interactive with the visitors» will take place near Kyiv in the «Kyivan Rus Park», during which the guests will get acquainted with the unique horses of historical breeds. 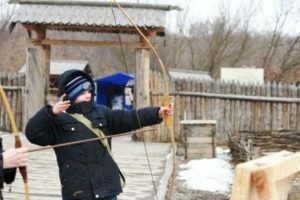 An unforgettable journey into the epoch of the Middle Ages, live communication with the purebred horses, ancient Slavic winter amusements, master-classes, delicious dishes prepared on open-fire by the princely cooks and a lot more of new and interesting from the life of our ancestors will be waiting for the guests. Ancient Kyiv opens at 10:00. The program starts at 13:00. The ticket price: a full adult ticket – 150 UAH, for pensioners and students – 100 UAH, for schoolchildren – 50 UAH, for preschool children – for free. Ancient Kyiv in the «Kyivan Rus Park» is situated in the vill. Kopachiv, Obukhiv district, Kyiv region.